African Elephant is the largest living land animal (larger than the Asian Elephant). These mammals have very strong social bonds and live in family groups headed by a female (called a cow). Males (called bulls) occasionally join the group. Elephants are excellent swimmers. Elephants have few natural enemies except man, and they are in danger of extinction due to loss of habitat and poaching (they are killed for their ivory tusks). 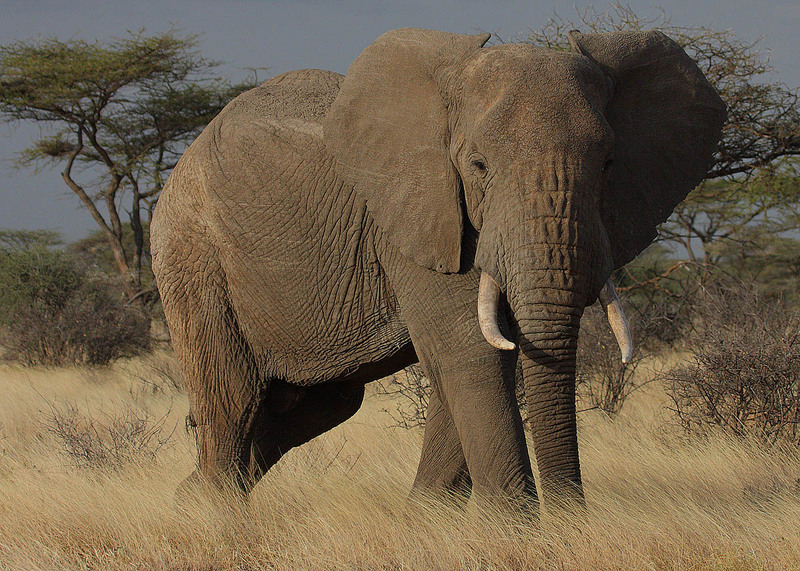 African Elephants have large ears (up to 5 feet=1.5 m long) that are shaped like the continent of Africa. The ears not only hear well, but also help the elephant lose excess heat, as hot blood flows near the surface of the skin. Elephants eat roots, grasses, leaves, fruit, and bark. They use their tusks and trunk to get food. These herbivores spend most of their time eating. Bulls can eat up to 300-600 pounds (130-260 kg) of food each day.